Niulife DME® Extra Virgin Coconut Oil is the only Australian owned, handmade certified organic oil that is 100% village-produced within an hour of the opening the nut with all profits going directly back to the communities that made it. We pay the villagers first before we sell the oil. Plus we give back all profits so they can enjoy a better quality of life. With so many coconut oil brands now on the market it’s hard to know which coconut oil to choose, especially when one is $4.99 and other is $9.99 for the same size jar. Cheap coconut oils are often mass produced copra oil made in factories from coconuts that have been left open for days or even weeks. The oil is often low quality and requires refinement through bleaching and deodorizing with harsh solvents and chemicals. This process removes the natural anti-oxidants and volatiles that give pure coconut oil its flavour and aroma. Good quality cold-pressed organic virgin coconut oils are mass produced in factories from local and imported nuts that aren't necessarily "certified" organic or fair-trade. Often the final product is a blend of different quality of oils. High quality, factory-made Certified Organic Virgin Coconut Oil are made in modern factories with good quality control from local nuts that have been certified by 3rd party organic agents. Whilst these are great products, the only return to the coconut growers are a small minimal price they receive for their coconuts, and possibly for shipping them to the mainland. But Niulife DME+ Extra Virgin Coconut Oil is different. 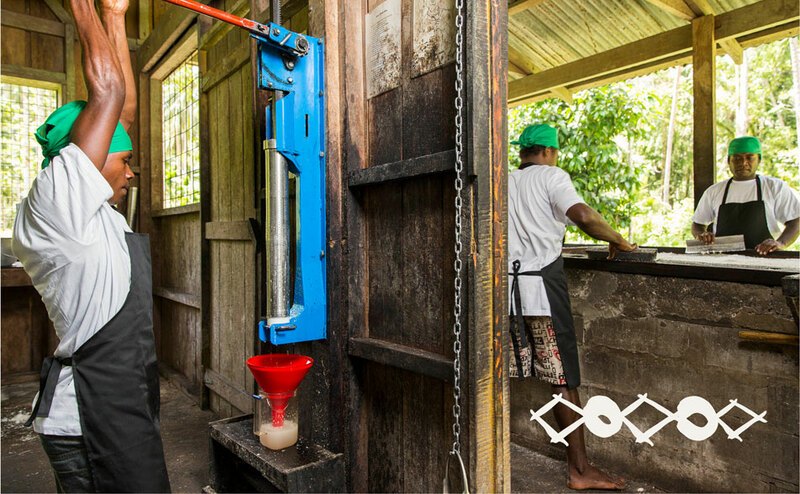 Our DME™ Extra Virgin Coconut Oil is handmade in the villages where the coconuts are grown. The coconuts are hand-pressed within an hour of opening the nut, then triple filtered to ensure only the purest Extra Virgin Coconut Oil makes it into every jar of Niulife. Best of all, we pay the villages for all the oil that they produce (before we even sell it) plus 100% of the profits from the sale of ALL Niulife products go directly back to support the communities who make it. So each jar really does make it a difference. Thanks to you, villagers have a new life. Buy Niulife Extra Virgin Coconut Oil today and make this possible. Thank you tumas!